can someone tell me what is a good notation/s for a good set up for yoshi? Setup, hmm There are many setups. A setup is doing a (move/set of moves/positioning) that prepares the ground for the next move that is your target move, usually jugglestarter, unblockable, powerful move. Kunimitsu: f+4~f (SET) 2 - doing a knee on block is a setup for SET 2. It double-hits with punches and counters everything else. 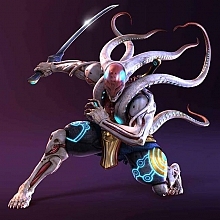 Yoshimitsu: SS+4~KIN 1+2 - doing a SS+4 on block that transitions into Kinchou makes 1+2 uninterruptable. df+1~uf+3 - high crushes punches. b+1,1 - a setup for anything up to i14, like punches, d+4, df+4, db+2,2,2, and also evasive SS moves, like SS+4, SS+1. NSS stance is one big setup for NSS flash. Imagination is your only limitation. In most cases of non-programmed setups above, beware sidestep! Thanks. oh and BTW I saw your name in youtube. is that you playing at WCG? man your cool. ive always want to play in WCG. but i think i still need to improve more. like 100 years more. Yeah, unfortunately that day wasn't my best day. ^_^ Lack of cold blood killed me. As one of my friends says: I should "stay cool and flash"
but you still put up a great fight. may i ask. what do you usually use to punish your opponent? Hmm, you mean punish or whiffpunish? For whiff punish, I use b+2,2 most often, but it depends on the range I'm actually in. I also tend to use 3~4 as a whiffpunish, and d+2,2. Also, df+2,2 when I'm sure I'm in range. For block punish, I'm doing my best to use the most adequate punishers, launchers for -15 and more, and f,f+4 as my launcher of choice when blocking low moves that give blocking stagger (like hellsweeps).